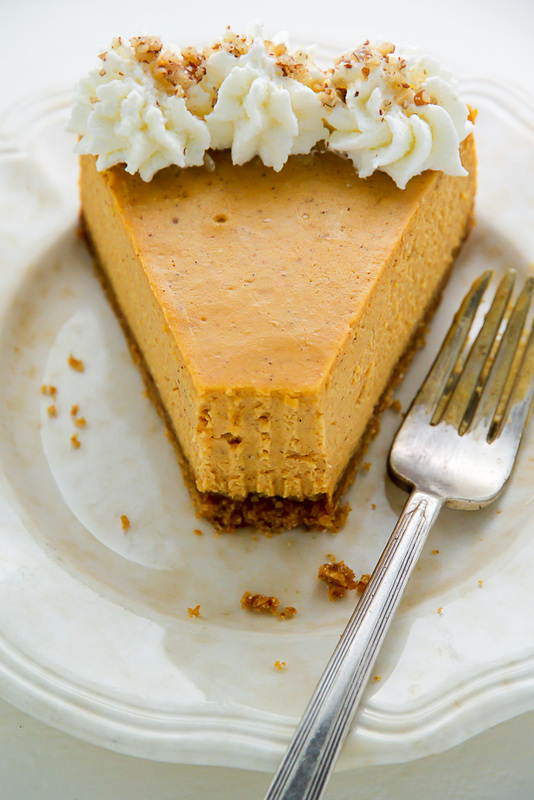 Creamy Pumpkin Pie Cheesecake is smooth as silk and full of true pumpkin flavor. Fall dreams are made of this. 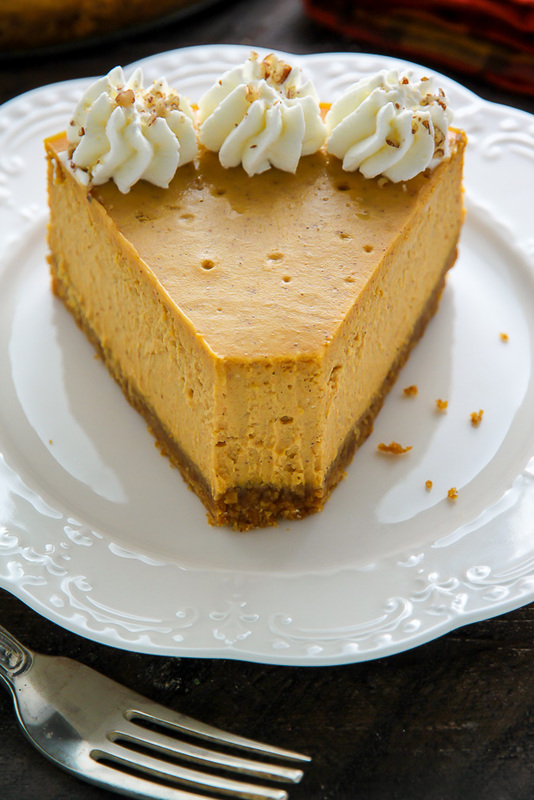 Today I’ve got a recipe for you I’ve made a whopping 5 times and am completely obsessed with: Classic Pumpkin Pie Cheesecake. 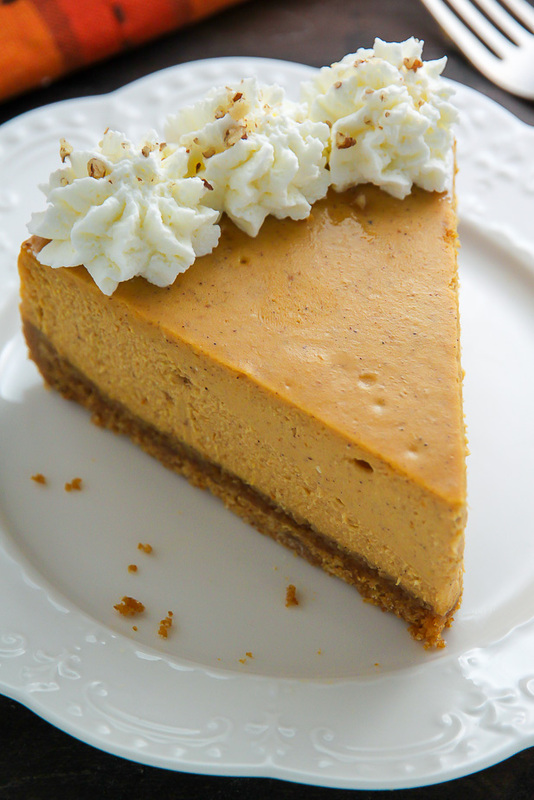 Now, I am no stranger to pumpkin cheesecake recipes. If you take a peek into the recipe box you’ll find Pumpkin Ricotta Cheesecake, Creamy Greek Yogurt Pumpkin Pie Cheesecake, and Pumpkin Pie Cheesecake Bars! Can you tell I really love pumpkin cheesecake or whaaat? I have a weakness for taking classic recipes and kind of turning them upside down… but this holiday season I wanted to finally perfect my very own recipe for a classic pumpkin pie cheesecake. I definitely had to practice some self control during the recipe testing process because it was SO tempting to pull an Ashley and add bourbon… or brown butter… or a layer of caramelized pecans (still dreaming about that twist!). But I made it through! And the results were worth every moment of temptation, frustration, and uncertainty. 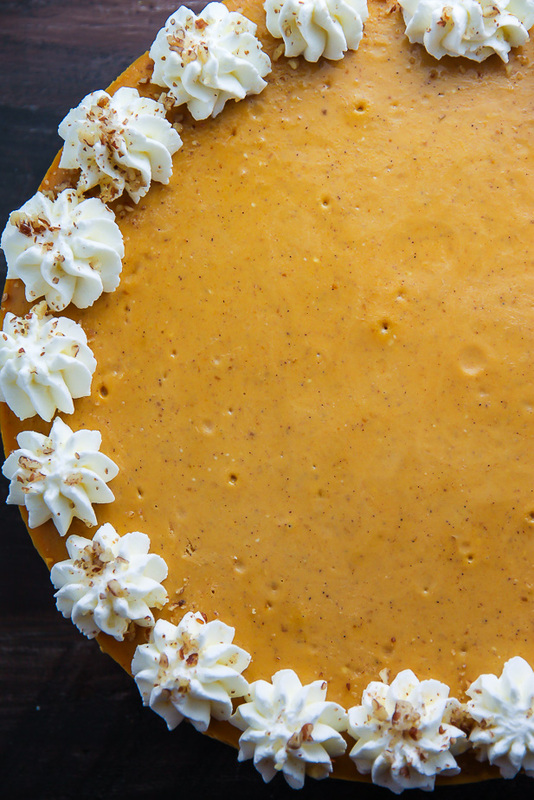 This classic pumpkin pie cheesecake is silky smooth, richly spiced, and bursting with real pumpkin flavor in every dreamy bite. Hallelujah! 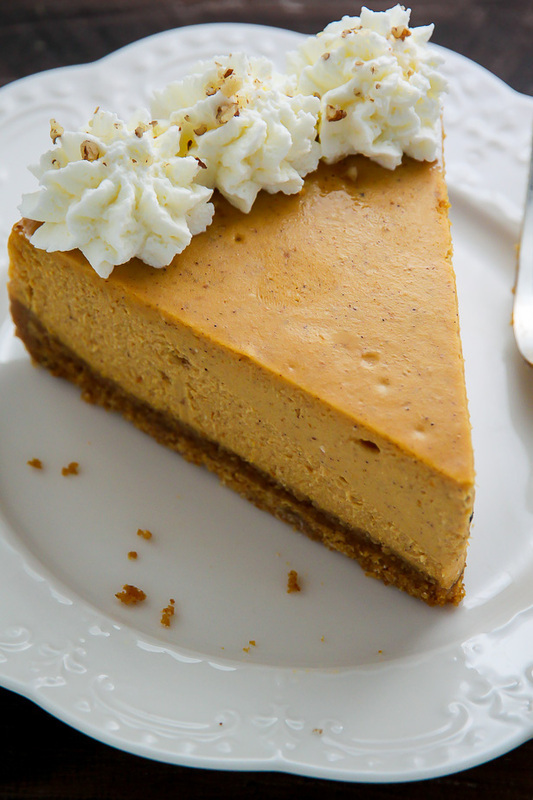 This gorgeous pumpkin pie cheesecake is made up of 3 parts: the graham cracker crust, the cheesecake filling, and the whipped cream. Since making a cheesecake at home can seem intimidating at first, I’m going to walk you through each step. <—— That’s what friends are for! The first step is making the graham cracker crust! And it’s seriously simple. 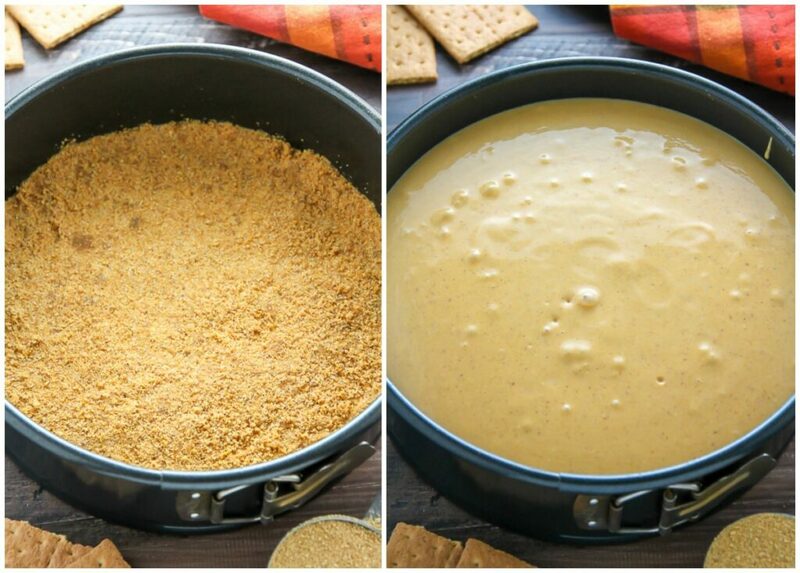 Ingredient wise you’ll need graham crackers, melted butter, sugar, and a pinch of salt – that’s it! You will need to pulse the graham crackers into crumbs, or – if you want to make things even easier (!!!) – you can buy already crushed graham cracker crumbs at the store. I typically find them in the baking aisle, somewhere near the pie fillings/ ready-to-bake crusts. To assemble the crust you’ll combine the cracker crumbs, sugar, and salt, then fold in the melted butter and stir until it’s well combined. You want all of the crumbs to be moist from the butter. At this point you’re going to dump the crumb mixture into a lightly greased 9″ springform pan and press it down firmly, working from the center and slightly up the edges. BTW! This recipe calls for a water bath. If you’re unfamiliar with the water bath process, read on! A water bath is simply the term bakers use when they place a baking pan (in this case, our cheesecake) into a larger pan that’s been filled with hot water. Taking this extra step helps insulate the pan from direct heat on all sides while it bakes. The water bath method helps your cheesecake bake gently, ensuring the finished product doesn’t burn, curdle, or crack. It also helps the cheesecake maintain its silky smooth texture. When it comes to choosing a pan for your water bath, choose one that is as tall as the cheesecake pan and large enough to leave a few inches between the cheesecake pan and the outer rim – you want enough room for the water to circulate easily. When you’re ready to make your water bath, here’s what you do: Adjust an oven rack to the middle position. Preheat oven to called for temperature. When the oven is preheated, carefully (using an oven mitt) pull out the middle rack and place your large pan on it, fill the pan halfway with hot water, then place the filled cheesecake pan in the center of the water bath. Slowly slide the rack back to its full inserted position, close the door, and bake the cheesecake according to instructions. If you’re using a springform pan it’s essential to wrap the pan in heavy-duty tin foil to avoid water seeping in. I wrap my pan from every angle pressing the foil in and around to prevent a soggy crust. OK! Time to talk about the filling. You’re going to need cream cheese, sour cream, pumpkin puree, eggs, egg yolks, sugar, spices, and a spot of flour. Few things! For the cream cheese it MUST be verrrrry soft. I typically leave my blocks of cream cheese out on the counter for two hours before I plan on baking. As for the pumpkin puree, you can use canned or homemade – but just make sure it’s not pumpkin PIE puree. Rich spices, smooth pumpkin, and decadent cream cheese combined in just the right way. This dessert is bursting with simple, decadent flavor. 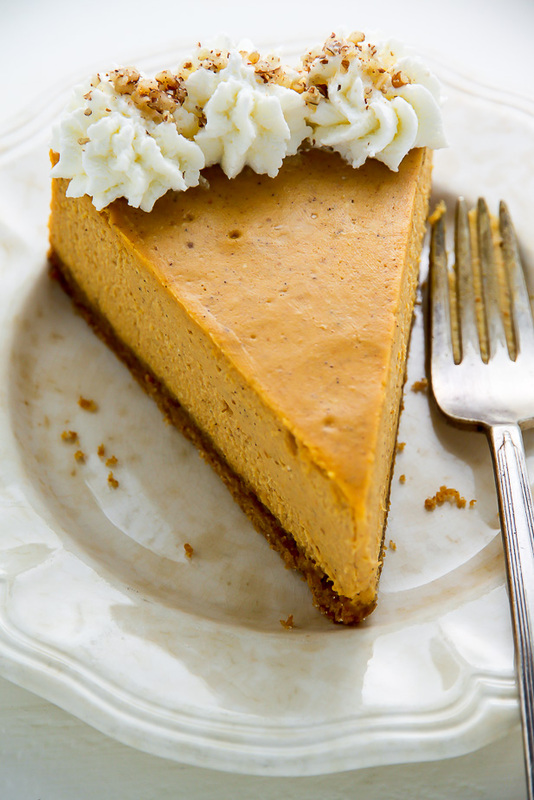 That, my friends, is what makes this classic pumpkin pie cheesecake the best around. I hope you bake this cheesecake and savor each silky smooth bite. It’s pure perfection on a crisp Fall day. 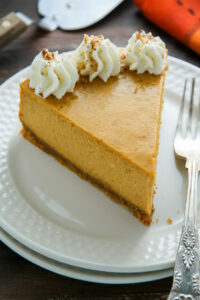 Ultra creamy and richly spiced Classic Pumpkin Pie Cheesecake! This is perfect for the holiday table. In the body of a blender combine the graham crackers, salt, and sugar; pulse until the crackers have been completely pulsed to crumbs. Stir in the melted butter; stir well to combine. Press down into a 9-inch springform pan, pressing the crust down firmly and slightly up the sides. Wrap the pan VERY well in layers of heavy-duty tin foil; set aside. Beat cream cheese and sour cream in a blender until completely smooth. Add in the eggs, egg yolks, pumpkin puree, sugars, and spices, pulse until well combined. Add flour and vanilla and pulse for another 30 seconds, or until flour has completely disappeared into the batter. Don't over mix! Pour filling into crust, and spread evenly, smoothing the top. Place the springform pan in a large baking pan (with high sides) and fill the pan halfway with hot water; this is your water bath. Place the cheesecake in the oven and cook cheesecake for 1 hour and 20 minutes. Turn the oven off and let the cheesecake sit for 45 minutes inside the oven with the door shut. The cheesecake should be still slightly wiggly. Remove cake from oven, run a knife very gently around the edge of the cake, and let it sit in the pan for 15 more minutes before covering loosely with plastic wrap and refrigerating for at least 4 hours. When ready to serve, slice, top with a dollop of whipped cream and enjoy! What a gorgeous cheesecake! I bet this would be perfect with a big mug of hot coffee. It’s the ideal dessert for fall! This looks delicious! I’m going to attempt it for Thanksgiving. Thanks for sharing. Im attempting to make this for Thanksgiving!!! This cheesecake is amazing. Thank you for sharing this with us. Remember to wrap your pan in HEAVY DUTY FOIL. She emphasizes do so. I didn’t listen, used normal foil, didn’t wrap the pan very well, and my crust got water on the edges. Please wrap the pan well. Thanks again. My family is in lobe with this cheesecake. Hi Sean! So happy you loved this pumpkin cheesecake as much as we do 🙂 Happy holidays! Instead of wrapping the pan with the foil, can you put the water bath a rack below the cheesecake? Yes, but it’s not a sure thing it won’t crack a little this way. Question about the water bath technique: I wrapped my spring form pan with 2 layers of heavy duty foil all the way to the top, no tears or piercings. But when I took off the foil after baking, water stil came out!! I am thinking it got in there from the steam in the oven. Was I suppose to wrap the foil over the top edge of the pan and into the inside a bit to prevent this? But the cake rises to the top, and it might touch the foil if I fold it over like that? I’m making 1 more for the holidays….What to do?